"The greatest enemy of knowledge is not ignorance, it is the illusion of knowledge!" Hawking, n.d.
the teaching presence is very important to create that balance and setting the scene! Besides setting the scene, the “teacher presence” acts also as a ‘referee’ if you will. People experience angst when under pressure, have deadlines, and their own work pressures. Our own PBL group had issues. We had group members who were sick, had their own commitments, kids, etc. So when we had pressure points, our facilitators were the ones to ensure that everyone was calm. 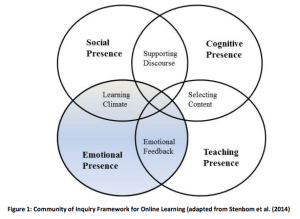 If we look at the original Community of Inquiry it has the ‘teacher presence’, which is so critical to setting the scene, but also to ensure that the group functions as it should. However, when in an online environment there is an element called the “online disinhibition effect” (ODE), which basically impacts on people where people allow themselves to say things that they would maybe not normally say. They lose their inhibition and ‘let lose’ a bit more. This is when the ‘teacher’ or facilitator becomes that much more important. Rientes and Rivers (2014) proposed adding the emotional element to the COI model, arguing that the emotions are a powerful motivator, therefore engagement and achievement would increase. Technology, though, is a barrier for facilitator in this case. It is not easy for the facilitator to pick up on emotional cues in the short time frames that they have with the group. Moreover, it is very easy to misread, mishear or misinterpret, especially when there are other languages involved. So this makes it so much more important to have an experienced facilitator in place, especially in a course like Problem Based Learning, where the learner is may feel at times a bit lost, dealing with ‘vague’ scenarios, and with group members that are ‘far’ away. So how would I do things differently, if I were the facilitator? I don’t think I could do things much better than that of my own facilitator, Francisca, who really was supportive, and really did an amazing job of trying to read those ’emotional cues’. In fact, it was her leadership and insights that lead me to research this aspect of the “Missing Element” of the COI, and thereby for the first time really expose me to literature that I had yet to read. So I think, I would like to explore more of it could be possible to build more of an emotional presence in an online course. Reblogged this on Thinking about online collaboration and learning. I have enjoyed reading something very new to me, which is the concept of an emotional aspect of the community of inquiry. Do you think that emotions play a larger role in online learning communities than in traditional classrooms? 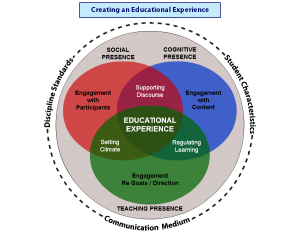 You also touch upon what I have emphasised in my blog, which is so reinforcing to see 🙂 Namely, you mention “teaching presence” as a crucial attribute of PBL as a form of teaching, especially in the online context. A role that a facilitator should assume in an online PBL course must be well thought out to help the participants overcome this sense of being lost and vagueness, which novice online learners often experience. ONL181 Starts with a Bitmoji & Zest! The Reformation of the 21st Century?